"Although color photography has existed since at least 1879, it didn't become popular until many decades later. The overwhelming majority of photos taken during World War I were black and white, lending the conflict a stark aesthetic which dominates our visual memory of the war. 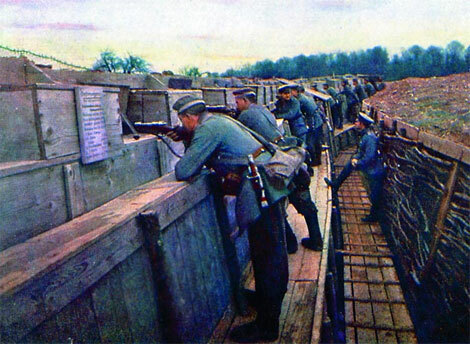 Hans Hildenbrand, one of nineteen photographers employed by the Kaiser to document the war, was the only German to take photos of the war in color. Hildenbrand, who first started experimenting with the "Autochrome" color technique in 1909, founded a society for color photography in 1911 his native Stuttgart. His scenes are all posed, not for reasons of propaganda, but rather because the film he was working with wasn't sensitive enough to capture movement." I didn't realize how much I was impacted by the B&W aesthetic of old war photos. Seeing these poor souls in color quite literally shines new light on their world.